When it comes to being one of the better teams in a league, blowouts against weaker teams are not always guaranteed. For the Laurier Golden Hawks, now sitting at 11-5 and second in the OUA West, they understand this. There are games like the one against Toronto and then there are games like the one against Nipissing that was a close overtime win. The challenge of each one is what the Golden Hawks faced in their weekend of back-to-back games against the Algoma Thunderbirds having won 89-68 and then 96-87 overtime win. In the first game, the first half was played very closely as it took for a three-ball from Ntore Habimana with time almost expiring in the half to take the Hawks’ lead from 3 to 6 points. In the third, the Hawks managed to push themselves to their largest lead at 13 points. They went on to seal it with an offensive outburst of a fourth quarter, outscoring the Thunderbirds 29-17 and the final score being 89-68 behind Ali Sow’s 37 points and Kemel Archer’s 18 points and 8 rebounds. “I thought, defensively, we were able to really close out the fourth quarter much better in the first game. Getting stops way earlier in the quarter and throughout the quarter,” coach Serresse said. The second game was similar in that the first half was close throughout. This time around though, Algoma came out stronger as they shot the ball better than the first game as well. “We didn’t start well at all. We had a little bit of a defensive scheme that we wanted to put in place and it wasn’t clear with everybody, clearly. So we gave them a few easy buckets early. With a buzzer-beating trey by Jackson Mayers of the Golden Hawks to go up 40-37 going into halftime, the Thunderbirds responded with a strong third quarter that put them up two, outscoring them 24-19 in the quarter. The Thunderbirds managed to build a 5-point lead on four different occasions in the fourth quarter, forcing the Golden Hawks to have to make comeback after comeback trying to stay alive. The Hawks managed to score five unanswered to tie the game and send it to overtime. This came with late game drama as they almost lost the game if it was not for a missed free throw by Nathan Riley of Algoma with one second left on the clock after being fouled by Matt Minutillo. In overtime, Laurier came out cooking to the sound of a sizzling 10-0 run and capping it off outscoring Algoma 14-5 and winning 96-87. 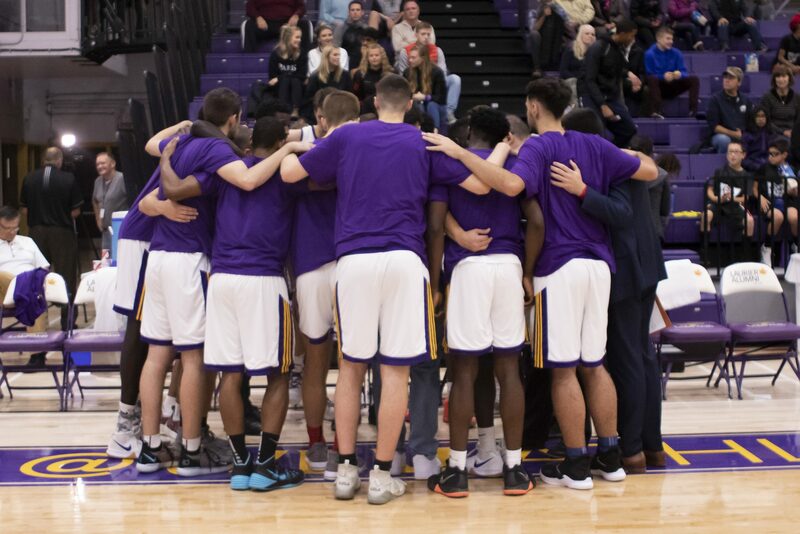 Behind another ridiculous performance by Ali Sow who scored 41 points, as well as 20-8-4 from Ntore Habimana and 16 points and 11 rebounds from Kemel Archer, Laurier was able to fight their way through adversity once again this season. “It’s always good to be able to close out games. It’s something we were able to do in the past, but not consistently. In this league, we talk about it all the time, there is no weak team, I find,” coach Serresse said. Next up for Laurier will be their annual School Day Game against the Guelph Gryphons on Jan. 23 followed by a matchup with the Waterloo Warriors in the ‘Battle of Waterloo’ on Jan. 25.